D. Damon Samuels, AAF, AIFD, PFCI, with Deborah De La Flor, AIFD, PFCI, and Gus De La Flor, after Deborah accepted the 2018 Tommy Bright Award. 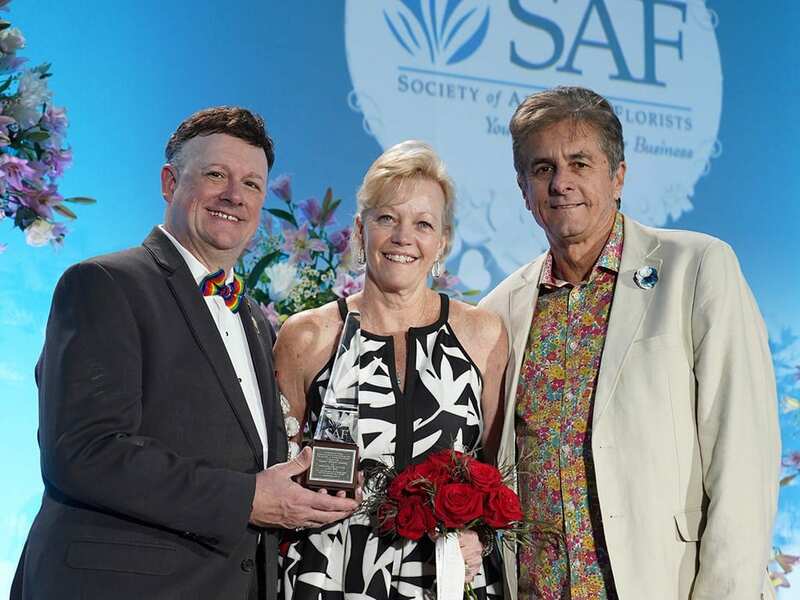 A Florida florist, beloved for her inventive design talent, business savvy, witty commentary and effusive personality, received the industry’s highest honor for floral educators. Deborah De La Flor, AIFD, PFCI, owner of De La Flor Gardens in Cooper City, Florida, received the Tommy Bright Award for achievement in floral presentation Saturday, Sept. 15, during SAF Palm Springs 2018, the Society of American Florists’ 134th annual convention at the Westin Mission Hills in Rancho Mirage, California. 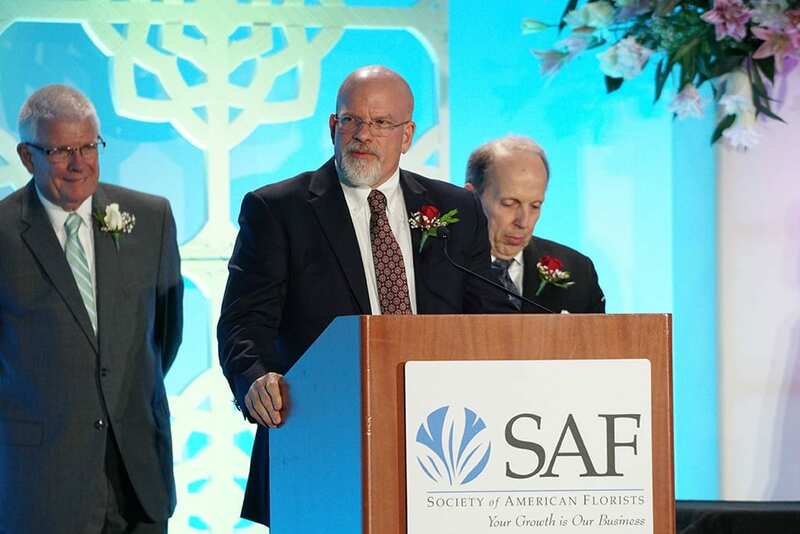 The Tommy Bright Award is presented by Professional Floral Communicators-International — the industry’s official speakers’ bureau, certified by SAF — to members who have gone above and beyond in educating and inspiring their peers. It is named after Ethel “Tommy” Bright, whose motto “learn more, teach others” reflects the values of PFCI. 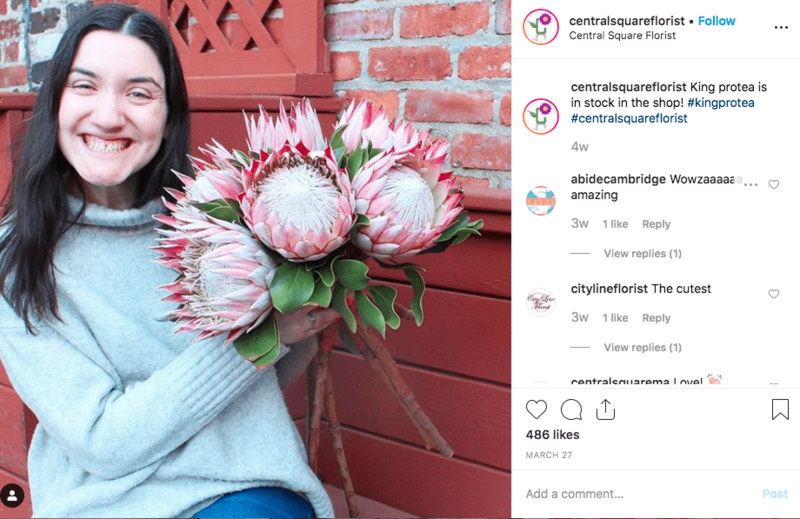 Upon seeing the news on social media, Edmonton, Alberta, designer Heather de Kok, AAF, AIFD, PFCI, sent De La Flor a congratulatory email, in which she thanked her for her many years of service to the industry. For 30 years, De La Flor has shared her passion for the floral industry with international audiences through design presentations, seminars, competitions and commentary. 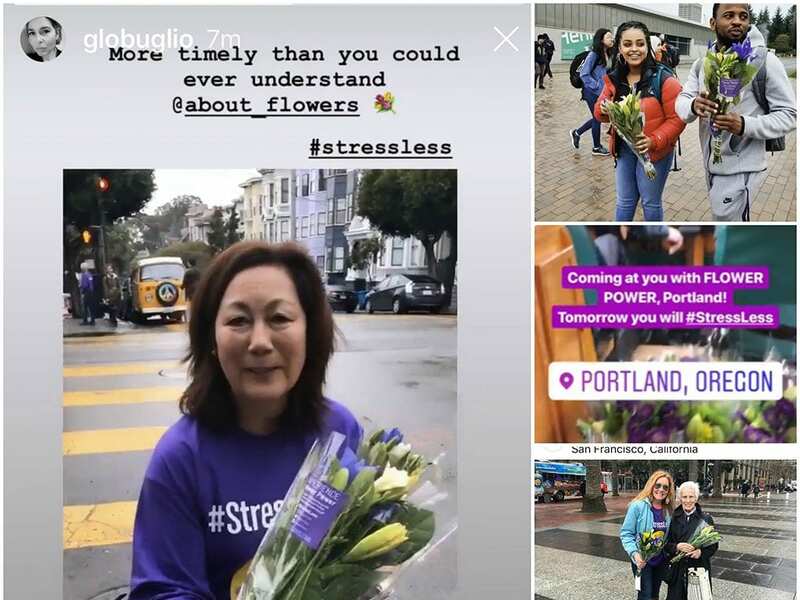 As a consultant for some of the biggest companies in the floral industry, including Syndicate Sales, Dole Fresh Flowers and Passion Growers, she’s anticipated and shaped trends that have influenced growers, wholesalers, retailers, suppliers and consumers. 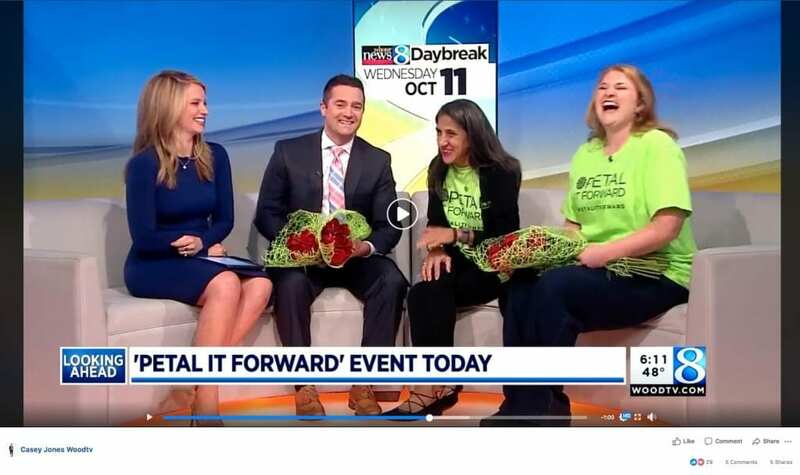 As an FTD Education Consultant, she has presented inspiring design presentations to thousands of floral industry professionals and students across North America. De La Flor has said her childhood helped shape her career. Upon her induction in 2007 to the Florida State Florists’ Association’s Hall of Fame, she told the Sun-Sentinel that she vividly remembered visiting her grandparents in Kentucky and feeling inspired by the verdant mountain landscape. 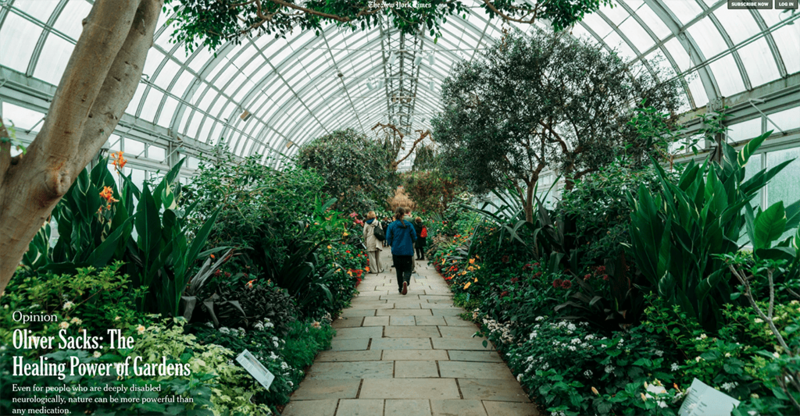 She brought that love for natural beauty back to her home in South Florida, where, as a little girl, she planted flower seeds and tended a vegetable garden. In 1981, De La Flor began working at Dolly’s Florist in Miami, where she met her husband, Gus. Two years later, De La Flor, still in her early 20s at the time, was named the Greater Miami Designer of the Year and Florida State Designer of the Year. In 1986, she and Gus opened De La Flor Gardens in Cooper City, Florida. They launched a second location in 2006 to house their landscape nursery. In addition, in 1996, the couple founded the Gateways to Americas Cup, a design competition for florists in North and South America. Among dozens of honors, De La Flor was inducted into the American Institute of Floral Designers in 1996 and into SAF’s Professional Floral Communicators-International in 2006. In 2000, she won First Runner-Up at FTD’s Americas Cup final in Atlanta. The same year, she won the FTD First Annual Great Masters Design Competition. De La Flor represented the United States at the Interflora World Cup in Melbourne, Australia in 2004, and she served as a judge for the 2015 competition in Berlin, Germany.